A return to the fundamentals of diving. 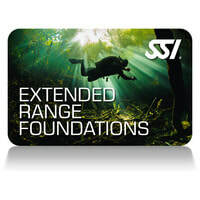 In the SSI Extended Range Foundations course your Instructor works with you in a workshop environment to improve your diving skills to the highest levels using the Extended Range Total Diving Systems and procedures. The training dives are completed at depths less than 12 meters / 40 feet, ensuring the maximum of in-water time for skill practice. You can expect to spend around 90 minutes in water on each dive. Upon completion your diving skill set will have been reset and you will be able to apply what you have learned to all your future dives no matter the configuration.